Unique Men's Celtic Ring : LOVE2HAVE in the UK! 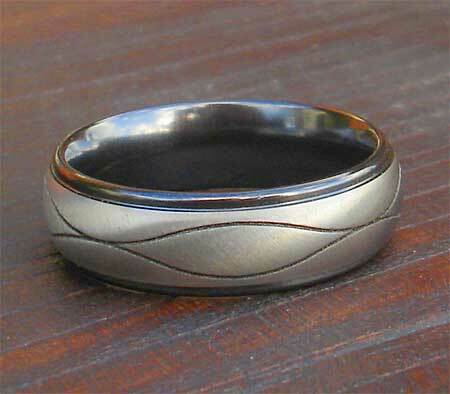 This men's Celtic ring is a domed shoulder cut profile ring measuring 7mm in width. It features a two-tone appearance with the shoulder cut and inner in a black finish and the central domed section in the natural grey of zirconium. The grey is achieved by what is known as relieving or the machining away of the black coating that was heat treated. 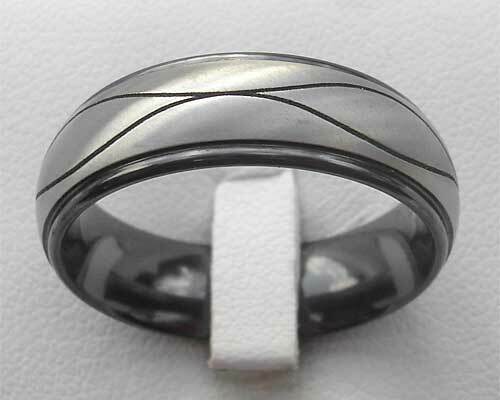 Engraved on the exterior of the ring is a black wave pattern that undulates around the ring's external. The wave looks like a frequency - something which some people claim binds our universe together in natural harmony. All our zirconium range of rings can make unique wedding rings as they can be machine worked into modern designs either in a natural colour or a black/natural combination. Profile(s) Available: Domed shoulder cut comfort fit.